1747 ~ 1763: he starts his career at an early age as a disciple of Fujikawa Hachizô I. 1763: Isematsu performs as a katakiyaku at the Takeda no Shibai, a hama shibai venue. 1768: Fujikawa Isematsu takes the name of Fujikawa Ryûzô; he performs mainly at the Takeda no Shibai. 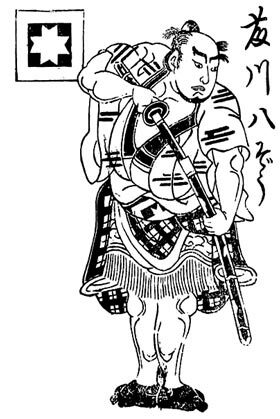 Fall 1772: he is adopted by his master Fujikawa Hachizô I. 11th lunar month of 1772: Ryûzô becomes tachiyaku and plays at the Naka no Shibai in Namiki Shôzô I's kaomise drama "Onoe Kikugorô no Baranu Banashi". 4th lunar month of 1775: premiere in Ôsaka at the Naka no Shibai of Nagawa Kamesuke I's drama "Hade Kurabe Ise Monogatari"; Ryûzô plays the role of Arakawa Sukune [more details]. 2nd lunar month of 1776: his adoptive father Fujikawa Hachizô I suddenly falls ill while performing at the Kado no Shibai in the drama "Gunjutsu Deguchi no Yanagi"; he has to retire and is replaced by his Ryûzô. 4th lunar month of 1777: premiere of Namiki Gohachi's drama "Tenmangû Natane no Gokû", co-written with Nakamura Akei and Tatsuoka Mansaku, which is staged at the Kado no Shibai; Ryûzô plays the role of Terukuni [casting]. 11th lunar month of 1777: Ryûzô plays at the Kado no Shibai the role of Mokubei, in reality Tsumaga Magosaburô, in the kaomise drama "Ôiri Kabuki no Tsuitachi", which is produced by Ogawa Kichitarô I and celebrates the shûmei of Shibazaki Rinzaemon II. 29th day of the 12th lunar month of 1777: his adoptive father Fujikawa Hachizô I dies. 3rd lunar month of 1778: Ryûzô plays at the Kado no Shibai the role of Hanaregoma Chôkichi in the drama "Futatsu Chôchô Kuruwa Nikki"; the role of Nuregami Chôgorô is played by Arashi Hinasuke I. 4th lunar month of 1778: Fujikawa Ryûzô takes the name of Fujikawa Hachizô II during the premiere in Ôsaka at the Kado no Shibai of Namiki Gohei I's drama "Kinmon Gosan no Kiri" [casting]; the new Hachizô plays the role of Kishida Hyôgo and the yakko Yatahei. 9th lunar month of 1781: Hachizô plays at the Kado no Shibai the role of Fukashichi in the drama "Imoseyama Onna Teikin"; the roles of Soga no Iruka and Omiwa are played by Nakamura Utaemon I and Nakamura Tomijûrô I. Fall 1781: Hachizô goes to Kyôto. 5th lunar month of 1782: Hachizô plays in Kyôto the role of Nuregami Chôgorô in the drama "Futatsu Chôchô Kuruwa Nikki"; the role of Hanaregoma Chôkichi is played by Yamamoto Giemon. 7th lunar month of 1782: Hachizô plays in Kyôto the role of Shibaroku in the drama "Imoseyama Onna Teikin". 6th lunar month of 1783: Hachizô plays in Kyôto the role of Danshichi Kurobê in the drama "Natsu Matsuri Naniwa Kagami"; the roles of Issun Tokubê and Mikawaya Giheiji are played by Nakamura Jûzô III and Shibazaki Rinzaemon II. Fall 1783: Hachizô goes to Ôsaka. 5th lunar month of 1784: premiere at the Kado no Shibai of Nagawa Shimesuke I's drama "Sumidagawa Gonichi no Omokage"; Hachizô plays the role of Jinzaburô [casting]. 6th lunar month of 1784: Hachizô plays in Kyôto the role of Danshichi Kurobê in the drama "Natsu Matsuri Naniwa Kagami"; the roles of Issun Tokubê and Tsuribune Sabu are played by Yamamura Giemon II and Ichikawa Danzô IV. 11th lunar month of 1784: Hachizô takes part in the kaomise program, which is produced by Onoe Ushinosuke I at the Kado no Shibai; he plays the roles of Matsuômaru and Sukune Tarô in the drama "Sugawara Denju Tenarai Kagami". 3rd lunar month of 1785: Hachizô plays at the Kado no Shibai the role of Kurofune Chûemon in the drama "Kurofune Deiri Minato". 4th lunar month of 1786: tour in Ise; Hachizô plays at the Furuichi no Shibai the role of Nuregami Chôgorô in the drama "Futatsu Chôchô Kuruwa Nikki"; the role of Hanaregoma Chôkichi is played by Yamamura Giemon II. 8th lunar month of 1786: Hachizô plays at the Kita-Horie Ichi-no-Gawa Shibai (Ôsaka) the role of Nuregami Chôgorô in the drama "Futatsu Chôchô Kuruwa Nikki"; the role of Hanaregoma Chôkichi is played by Mimasu Daigorô II. 12th lunar month of 1786: Hachizô appears on stage for the last time, playing in Kyôto the role of Dankurô in the drama "Shin Usuyuki Monogatari". He falls ill at the beginning of 1787 and dies in the old capital the 9th of the 3rd lunar month of 1787. Fujikawa Hachizô II was a popular tachiyaku and katakiyaku actor, who made all his career in Kamigata during the second half of the 18th century. He followed in the footsteps of his adoptive father Fujikawa Hachizô I, excelling like him in sumô wrestlers or otokodate roles. His last rank in the actors hyôbanki was very close to jô-jô-kichi.